Becky Albertalli needs no introduction. Her debut novel, Simon vs The Homo Sapiens Agenda was such a huge hit that even filmmakers could not stay away from it. 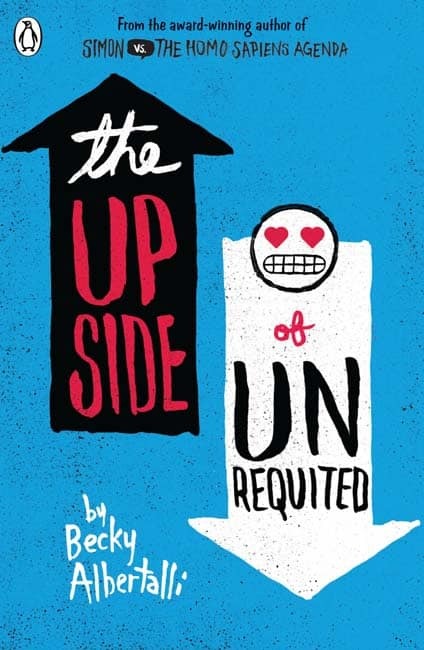 The Upside of Unrequited is Becky’s second novel but instead of going the linear way, I decided to read this one before I read Simon vs the Homo Sapiens Agenda. For those of you who don’t aren’t aware, there is one more book in the Simon-verse but more of that later. Molly Peskin-Suso is a teenager who, just like any other chubby teenage girl, suffers from self-image issues. Being pretty doesn’t help her much especially when she is constantly reminded of her “heaviness” by people around her. Molly has a gorgeous twin sister, Cassie who has always been a winner at the dating game, and this too doesn’t do much to boost Molly’s morale. Seventeen-year-old Molly has had twenty-six serious crushes and none of these guys ever realized that Molly was into them. The truth is Molly has always been scared of rejection. She simply doesn’t want to go down that lane. She knows that unless and until she gets her courage up and decides to “man-up”, there is nothing that can be done about it. Fortunately, fate is on her side and there is a handsome guy waiting to be taken. Will Molly forget her insecurities and give love a chance? Will her crush number twenty-seven ever turn into her boyfriend? To know this and much more, you’ve got to read The Upside of Unrequited yourself. Let’s talk about the plot, shall we? The plot is pretty straightforward. There is Molly and then there is Cassie. These two are twin sisters and share everything together until Cassie comes across the gorgeous Mina. Cassie falls head over heels in love with Meena and all of a sudden Molly finds herself getting replaced by this new girl. As Molly struggles to get her own dating life kick-started, a lot of things happen and the readers get to know a lot about Molly and her family. The pace of The Upside of Unrequited is flowy. There is always something happening (however minute) to keep the reader’s interest active. Breakups, new friendships, sister fights, serious crushing, rejections, parent troubles – there is enough in the story to maintain a good pace. But that’s pretty much it. There aren’t any serious plot twists to talk about, neither are there any intricate subplots. As already stated, it’s a simple plot and maybe or maybe not it works for this story. I think the characters were the only saving grace in this book. Molly is funny and cute, she is caring and sympathetic; very creative and Pinterest-y but even then, I sometimes found Molly ridiculously naïve and stupid. Some of the other characters that manage to win my heart are Reid, Mina, Olivia, Nadine and Patty. I couldn’t bring myself to like Cassie – the sister who is always selfish and acting out. I did like Reid though. He is a boy who is easily likeable and that, combined with the fact that he is a Tolkien nerd, was enough to influence me in his favour. 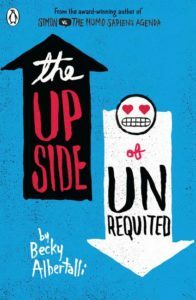 Becky Albertalli has a writing style that takes the reader into confidence right from the start. The language is easy and fluid and the book makes for a good sunny day read. It’s quite obvious though that the magic that had happened in her debut book is missing in this one. Writing an okayish story wasn’t enough especially when there are just so many books out there in the market very similar to this one. After all, who hasn’t read books about an insecure, shy, coming-of-age girl trying to figure out her place in the dating scene and in the real world? It’s pretty cliché, right? Is the climax good enough? The climax is pretty ordinary though it does give an apt end to the story of Molly. I had expected a little more from Albertalli but the book just ends on an uneventful (albeit happy) note. It felt like there was a need to finish the story and the author somehow ran out of ideas and decided to end the book right where her pen was. Finally, the thing that makes us all pick or leave a book – the entertainment quotient. The Upside of Unrequited is entertaining though it isn’t great. There are surely better books in the market but if somebody really wants to pick up a lazy Sunday young adult read, this book might turn out to be just what you are looking for. Pick the book up if you are looking for an easy and simple coming-of-age Young Adult Fiction. I suggest you skip the book if the only reason for your picking it up is that it is from the author who gave the world Simon vs The Homo Sapiens Agenda. Can’t wait to read it? Buy your copy of The Upside of Unrequited using the link below.